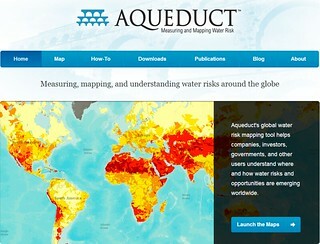 Aqueduct provides companies with comprehensive, high-resolution picture of water risks worldwide. The World Resources Institute (WRI) today launched a new online tool that maps water risk worldwide based on the most current, highest resolution data available. Companies, investors, and governments can use the Aqueduct Water Risk Atlas to see how water stress will affect operations locally and globally, and help prioritize investments that will increase water security. The online tool was developed by WRI, working with founding members of the Aqueduct Alliance, GE and Goldman Sachs, as well as Skoll Global Threats Fund, Shell, Bloomberg, Talisman Energy, Dow, United Technologies (UTC), DuPont, John Deere, Veolia Water, and the Dutch and Swedish governments. The Aqueduct Water Risk Atlas is a customizable global map, based on 12 indicators of physical, regulatory, and reputational risk. In a user-friendly way, companies can now evaluate how water stress, flood occurrence, access to water, drought, and other issues may affect operations. Additionally, the global map can be tailored specifically for nine water-intense industry sectors - from oil and gas, to agriculture, to chemicals. Bank of America Merrill Lynch used Aqueduct to inform investors about water risks and opportunities in a recently released research report. Through the Atlas, users can plot the locations that matter most to them – from facilities, to suppliers, to potential new markets or proposed power plants – and compare those locations’ potential exposure to water stress and risk. They can also review maps of individual indicators, such as seasonal variability, which may be highly important to their operations. The World Resources Institute is an environmental think tank that goes beyond research to create practical ways to protect the earth and improve people's lives.